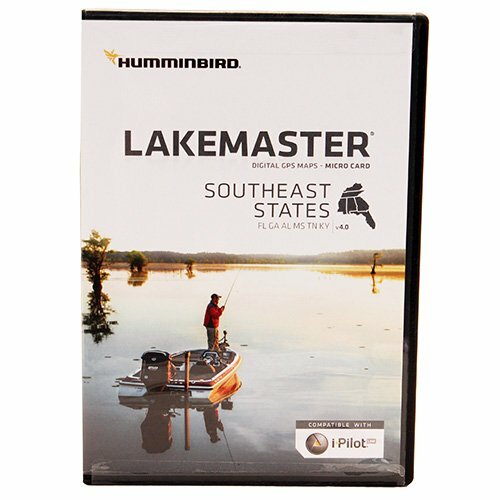 ""The Humminbird LakeMaster MidSouth States Edition, Version 2 Map Card features many FRESHWATER lakes in Texas, Oklahoma, Arkansas, Louisiana and Mississippi on one SD map card. Also Version 2 includes detailed coastal shoreline from Texas to Mississippi that allows anglers with i-Pilot Link to "follow the shoreline" at a specified offset for hands free fishing in shallow coastal areas. Great for fishing around mangroves, islands and inter coastal waterway shorelines. The MidSouth States Edition map card added over 80 high definition lakes to the Version 2 product and features over 240 total lakes with contours, of which 161 are now High Definition lakes including these highly requested water bodies: - Arkabutla, MS - Sardis, MS - Sardis, OK - Fort Gibson, OK - McGee Creek, OK - Carl Albert, OK - Ponca, OK - Travis, TX - Lake Houston, TX"". 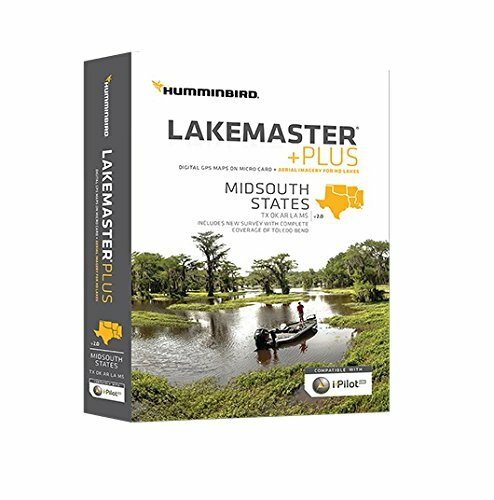 Lakemaster Plus Maps, MFG# 600009-6, Midsouth States. 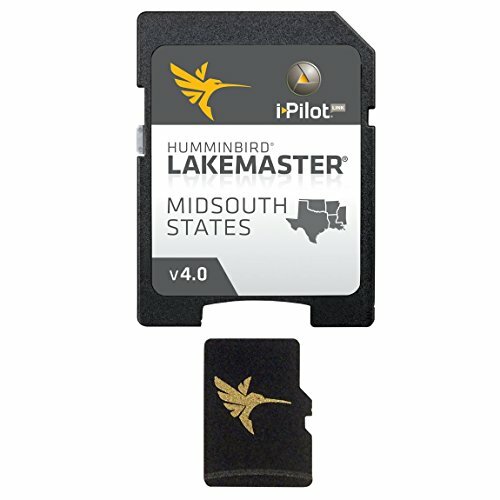 Combines many of the best fishing waters in Texas, Oklahoma, Arkansas, Louisiana and Mississippi, on micro-SD card with SD adapter. PLUS Version includes hi-def aerial image overlay. ""Humminbird SmartStrike takes you straight to the action by showing you where the fish are biting at any given moment. 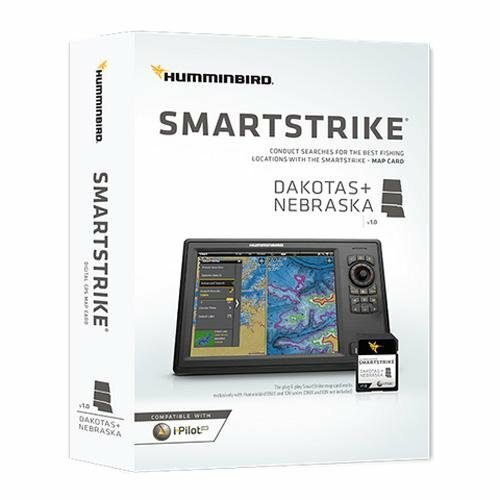 This powerful software program contained on the SmartStrike map card allows anglers to utilize humminbird Lakmaster High-Definition map data and extensive search algorithms to pattern and locate fish like never before. Based on search parameters like fish species, season, time of day, and temperature, the SmartStrike engine searches depth ranges, type of structure, proximity, and more to quickly revel and highlight the results on the lake map. Built a custom search based on criteria you choose, or click any location on a lake, select Find Similar Areas, and millions of data points are searched to return other areas like :- Shallow Water Highlight- Depth Highlight- Water Level Offset- Follow the Contour/with iPilot Link equipped Minn Kota trolling motor Smart Strike full search functionality is exclusive to High-Definition waters only. Lakemaster Maps, MFG# 600009-7, Midsouth States. Combines many of the best fishing waters in Texas, Oklahoma, Arkansas, Louisiana and Mississippi, on micro-SD card with SD adapter. 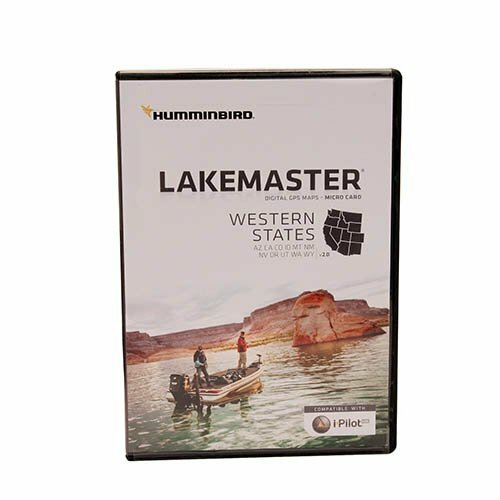 Lakemaster Maps, MFG# 600011-3, LakeMaster Western States Edition for Arizona, California, Colorado, Idaho, Montana, New Mexico, Nevada, Oregon, Utah, Washington, and Wyoming. On SD/Micro-SD card. Revealing the water's secrets to help anglers pursue their passion for the sport: it's what we've done since the first fish finder we developed as techsonic Industries in 1971, and it's what We'll always do. Whether you're competing in a fishing tournament with the solid Series or making the most of a family vacation using the Helix Series, count on us to help you find the best fishing hot spots faster, and to explore the water with confidence. Because that's what makes Humminbird simply. Clearly. Better. 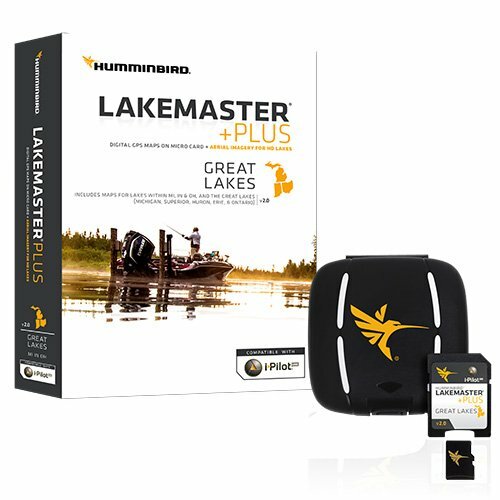 Lakemaster` s high-definition accuracy and detail combined with humminbird`s ground-breaking side Imaging sonar capabilities give anglers advantages on the water like never before. Follow-the-contour technology will change the way you fish. 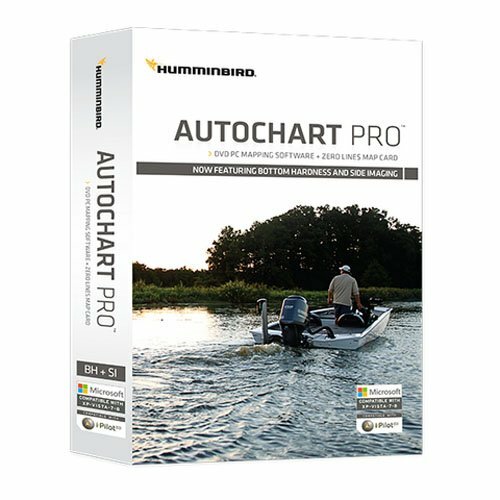 Simply select a contour and automatically follow it by combining your Chart with a Minn Kota i-pilot link and your Humminbird unit. Plus; you can set a path directly on or offset from any contour line. Select a Depth range with the depth-highlight feature to keep you in the strike zone. Use shallow-water highlight to identify hazardous areas or shallow water. Water-level offset lets you adjust the Chart to the current water level. Features:- high-definition accuracy.- Depth highlight lets you select a Depth or Depth range.- shallow water highlight helps identify hazards.- water level offset for true-to-depth contour lines.- set a path following or offset from any contour line. Specifications: - covers southeast States: Florida, Georgia, Alabama, Mississippi, Tennessee and Kentucky. 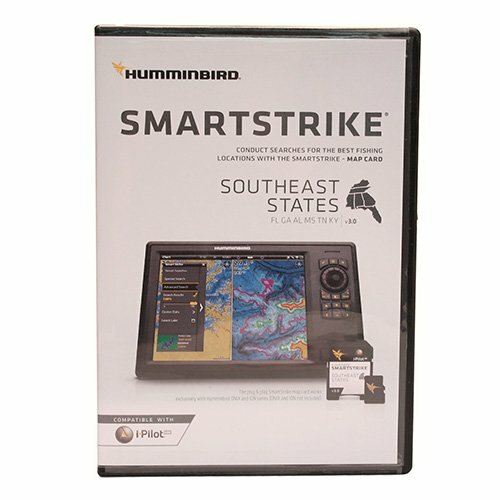 SmartStrike is a new family of map cards that parallels the standard Humminbird LakeMaster editions. Coverage area and lake lists remain the same and both are compatible with Humminbird legacy models and the ONIX/ION units. The difference is that when a SmartStrike card is used in an ONIX/ION unit, it has the special capability of using the Contour Elite search functions on (and only on) any of the High Definition lake maps for that card. It's like looking into a digital crystal ball. The new Humminbird SmartStrike takes you straight to the action by showing you where the fish are biting at any given moment. Based on search parameters like fish species, season, time of day, and weather conditions, the SmartStrike engine searches depth ranges, type of structure, proximity, and more to highlight areas on High Definition lake maps where your prey is most likely to be located- before you even wet a line. Build a custom search based on criteria you choose, or click any location on a lake, select Find Similar Areas, and millions of data points are searched to return other areas like it. SmartStrike full search functionality is exclusive to High-Definition waters only and Humminbird ONIX/ION units. Looking for more Humminbird Map similar ideas? Try to explore these searches: Onyx Pillow, 25m Adapter, and St Louis Rams Bracelets. Look at latest related video about Humminbird Map. Shopwizion.com is the smartest way for online shopping: compare prices of leading online shops for best deals around the web. 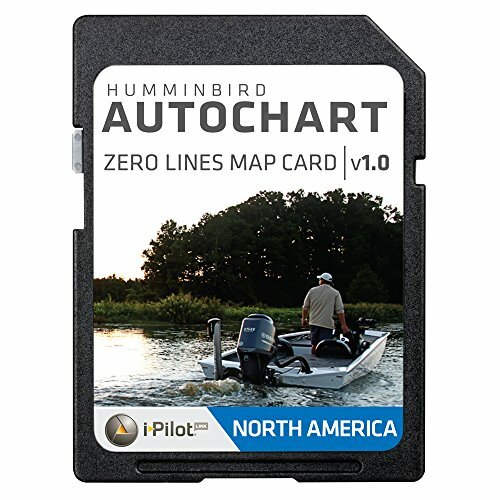 Don't miss TOP Humminbird Map deals, updated daily.